Got back yesterday arvo. England turned on the weather for us, by which I mean I haven't seen the sun since crossing the channel! Spent last night watching the England - Tonga match with Binnie, who left for Cambridge this morning, so we made the most of the night. I got home after midnight and resumed my search for a way to watch the AFL Grand Final, which continued until 4am when I gave up and went to bed. I'm toying with the idea of bombarding BigPond and the AFL website with emails about the extortionate setup of the internet clips of the AFL, which you have to have BigPond broadband to view. This meant I couldn't even watch the post-game review and resigned myself to reading the written account of the game, which was great but not quite the same seeing your team win. Cats broke the 44 year premiership drought in style; with the largest winning margin in a grand final ever! Was most happy to hear that Dad had got a ticket to the game, not as happy as him though I'll warrant. It's a big day of sport, no less than 4 rugby matches to keep me occupied! New Zealand demolished Romania in a boring one-sided affair. Australia took Canada, not as comfortably as they might but they took them. Fiji just beat Wales in an absolute thriller to go through to the quarter finals. It came right down to the last minute with the islanders scoring a try and cinverting to force the Welsh to score a try or die. (Pardon the pun) The hero of the match was Nicky Little who seriously injured his knee three minutes from the end of the game. Scotland - Italy smack it out for the 2nd place in their group later tonight. It's been a good day. France was brilliant. Cycled 800+ miles all up. From Calais to Paris via Giverny and Monet's Garden, train down to the French Alps, cycle over to Lake Annecy, train to Avignon, cycle to the Ardeche gorge, canoe down the Ardeche gorge, cycle back to Avignon, train to Bordeaux, cycle around Bordeaux and visit some vineyards. Then train to Paris and the Eurostar home. A month later and I have a decent tan, a ginger beard, scruffy hair, considerably less money than when I set out, 300 photo's, and tons of great stories. And, having watched as many games as possible, I'm pretty keen to play some rugby! 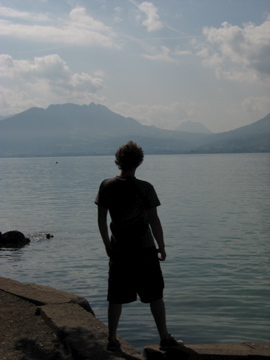 I'm camping by lake Annecy, somewhere near the French alps, at the moment. Have been here for a few days now with the Bish and we're both loving a bit of a rest. So far we've cycled 450 odd miles. Started down the northwest coast and into Paris, via Giverny and Monet's somewhat overrated gardens. In Paris we watched the Argentinians upset the French in the opening game of the Rugby World Cup on a big screen in the middle of the city. Was (very quietly) cheering for Argentina in a crowd of a few thousand excitable French. Caught a train from Paris to Bourg St Maurice and cycled from there over to Annecy. Have a look at our route on google maps, it's quite impressive. I'll apologise at this point for any random spelling errors as I'm using a retarded French keyboard and half the keys are in the wrong place. It was Bishs' birthday on Tuesday, great timing, and we celebrated by riding over a couple of mountains to another lake and back again, only took us eight hours. We've had two days of rest since then and are taking tomorrow very easy and ending watching the England South Africa match with a few cold ones. Saturday we train it down to Avignon (have abandoned the cycle everywhere plan and started using trains so that we actually get to spend some time in the places we want to see. So we'll do a few days along the Ardèche Gorge and then another train to Bordeaux to check out some wineries. Another train from there to Paris and then on the Eurostar to London and we're home! Annecy is truly stunning. Could easily spend the whole month here if we didn't want to see anything else. I randomly woke at 5am the other morning, pretty much unheard of from me, and was rewarded with a magical view of the pre-dawn mountains. Tried to replicate the feat this morning but neither of us could actually drag ourselves out of our relatively warm sleeping bags (we may have erred in basing our choice there on how small the bags packed away rather than how warm they are) to see it. Might have another crack at it. Then again. Might not. We shall see. Am off to France in an hour. Train down to Dover. Ferry to Calais. Then Cycling as far as we like each day and camping wherever we can. Gonna be AMAZING! Rugby World Cup is on while we're there as well. May fork out some dosh to see a match if we get close enough. Otherwise will just sit in the pub and watch as many games of an afternoon as we can manage. Contact for the month will be via email, comments here, or facebook. The week of awesomeness continues... I'm going paintballing tomorrow! The youth from church threw a surprise leaving party for me this afternoon as well, which was fun but did mean that I didn't get to Oxford and so purchased precisely none of the things I need for France. Worth it though, I came home with my face covered in Emma's pictures, vaguely resembling a demented pirate. I very nearly went out again still wearing said pirate face but fortunately saw the mirror on my way out the door and thought to wash my face before the cinema! Went to see the Bourne Ultimatum. Awesome. Just Awesome. I want to be Jason Bourne! There are two more books in the series that I've found, the Bourne Legacy and the Bourne Betrayal. I don't know if they'll make it to the silver screen but if the series continues with the same success the first three have had then I expect there are some more quality films to look forward to there!